Please explain a feather earring. I’ve always been kind of creeped out by feather jewelry. 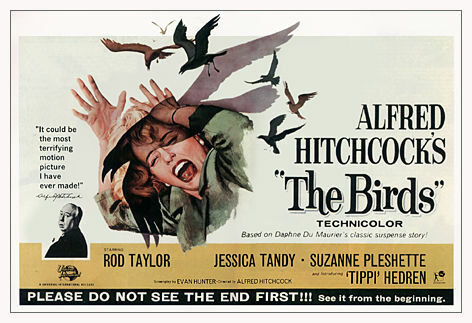 Mostly because I am freaked out by birds in general, having seen Alfred Hitchcock’s The Birds at an impressionable age. I am also freaked out by bird-bourne diseases (avian flu anyone? ), having read The Andromeda Strain, which I think was actually assigned reading in a middle school science class, at an impressionable age. I’m sure the feathers used in feather jewelry are not just picked up off the ground in the park, as I imagine they are, but you never can tell when you’re going to be exposed to a virus that could potentially wipe out humanity. Which could totally happen, as we’ve learned from countless films. Here is a fun top-ten list of Epidemic Movies to underscore my point. Also, that sh*t is tacky. Dorigen! We ARE sisters, because I saw Psycho too young. Meanwhile, love the movie list – updating Netflix cue NOW.